How to create your first online publication with FlippingBook Publisher? FlippingBook Publisher allows you to create your first online publication in just four steps. It will not take more than 10 minutes to create your first publication. Watch a short video about it. Click Import Files and choose a file you want to import. Choose Conversion Profile > Optimal or Best Quality. You can start with Optimal conversion, in most cases, it will work just fine. However, if you are not satisfied with the quality of your publication, you can re-import it using the Best Quality option. 3. Click the Start button. The file import will start automatically. Now you can design your publication. You can choose one of our 24 skins for your publication. You can also change the background image that appears behind the publication window. Note! You can also see instructions for uploading files to FlippingBook Cloud here. 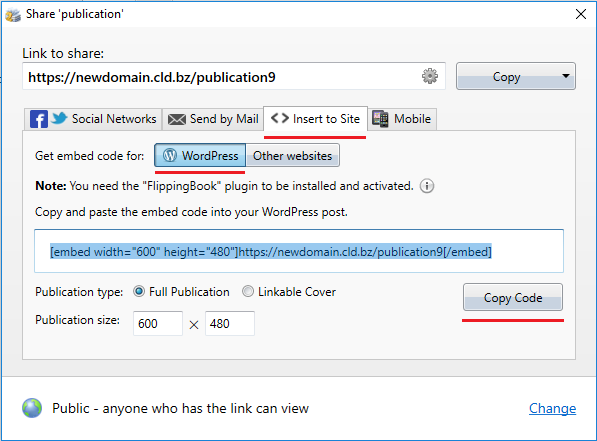 If you do not want to use our cloud, you can upload publications to your own server. You can upload either to "My Server" or directly to FTP. When you have successfully uploaded a publication to Cloud, you can share it with your readers. You can also send your publication via email by following the instructions provided here. 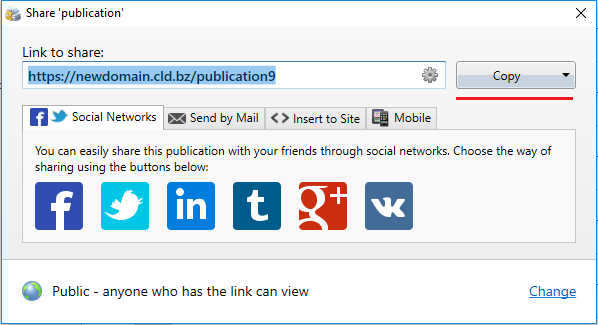 You can also share your publication to different social networks. 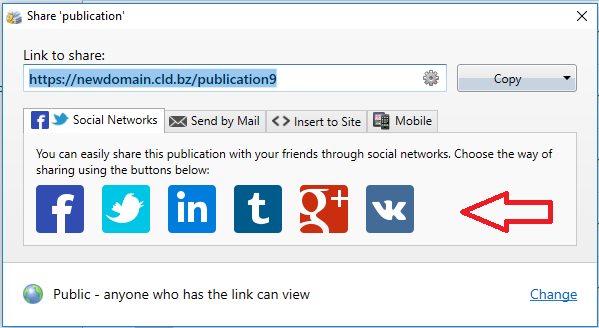 Just click the button for the social network you want to use in the bottom menu bar to share your publication there. For more information, please, refer to this article. To embed your publication into a website, choose the Insert to Site option at the Share window and copy the embedding code. 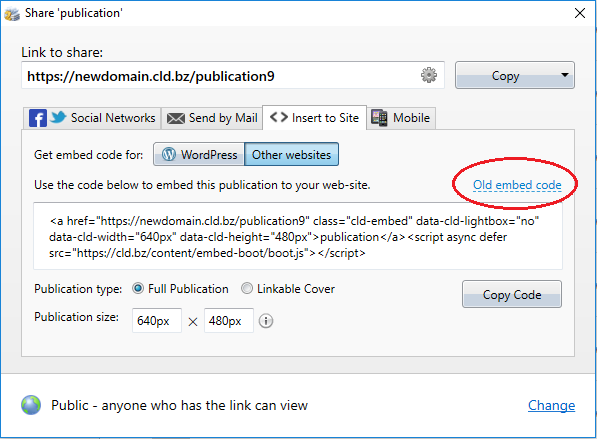 You can choose either an old embed code or a new one. Full Publication - A full publication is available directly on the page. Readers can turn pages, read the content and enjoy all the features without any redirects. 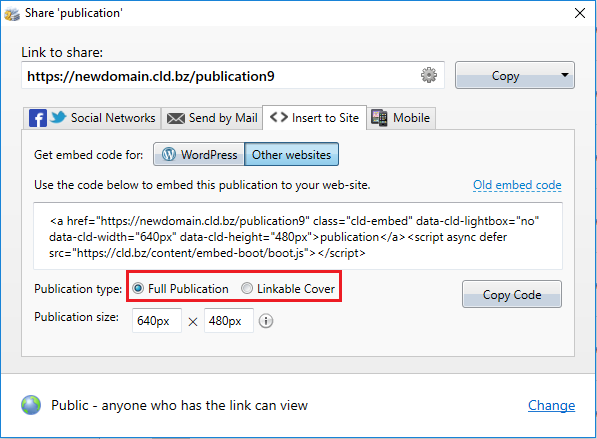 Linkable Page - This option allows readers to open your publications in a lightbox without opening separate tabs in their browsers. This is a convenient option because it keeps your customers on your web page. Detailed information on how to embed publications into a website is available here. 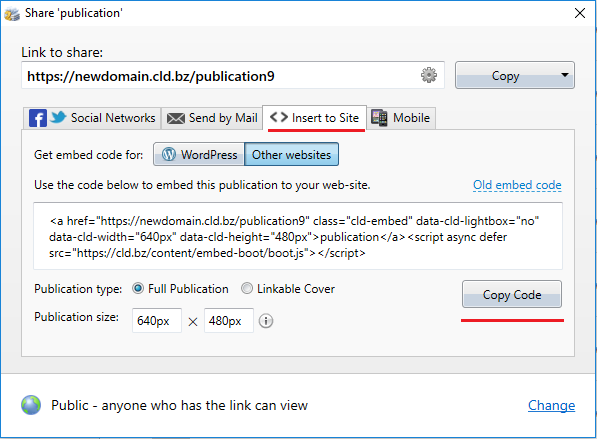 Copy the code with the button «Copy Code» and embed the code into a WordPress page anywhere you would like the publication to appear.